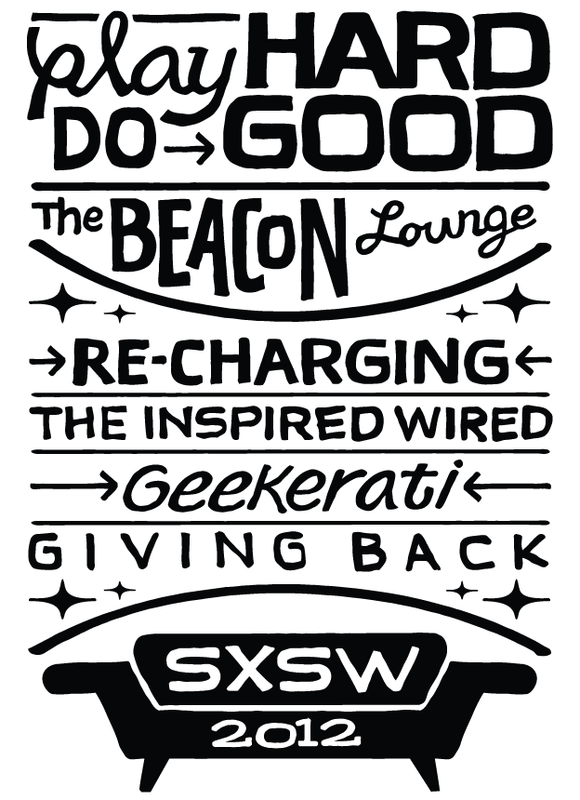 DESIGNING T-SHIRTS is a challenge I enjoy, so when I was commissioned to design and illustrate the 2012 Beacon Lounge t-shirt, I was ready for some fun. 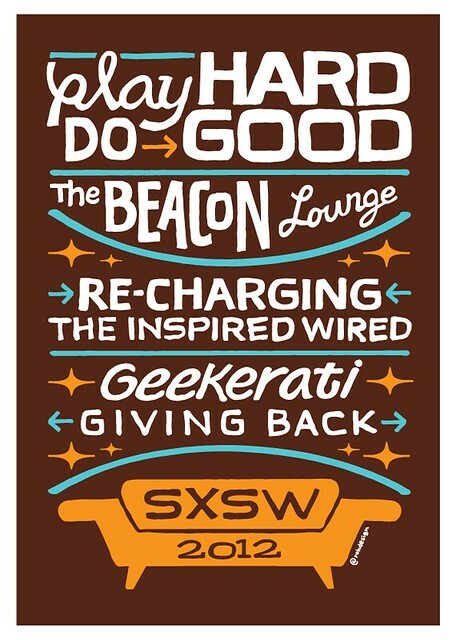 The Beacon Lounge is a quiet, relaxing and recharging space, nestled amid the chaos and activity of SXSW. It's the place you can take a break, meet people, eat tasty food, hear good tunes and help create lasting social good in the world. 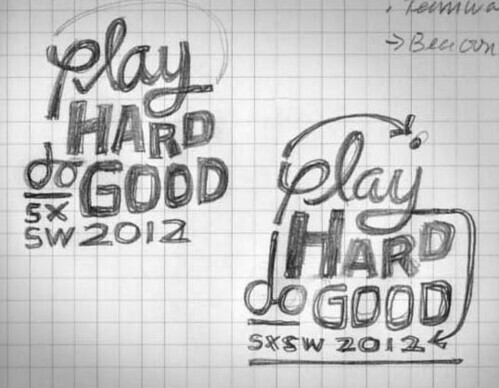 The initial sketch concepts for the t-shirt illustration were more along the lines of a simple type treatment, reflected in the pencil sketches above. I aimed to capture a lounge-like late 50s / early 60s feel with the typography on this piece, having fun with the modern couch and other retro touches. Once I had an approved concept sketch, I inked various design elements in my large Moleskine sketchbook and scanned them in. Once the elements were open in Photoshop, I was able to edit flaws, tweak details and prepare each piece for vectorization using VectorMagic — a key piece of my illustration toolkit. Once the black and white illustration was approved, I explored color. I knew I had a brown t-shirt as a base color, so I selected bright aqua and vibrant orange to compliment each other and the base white ink. 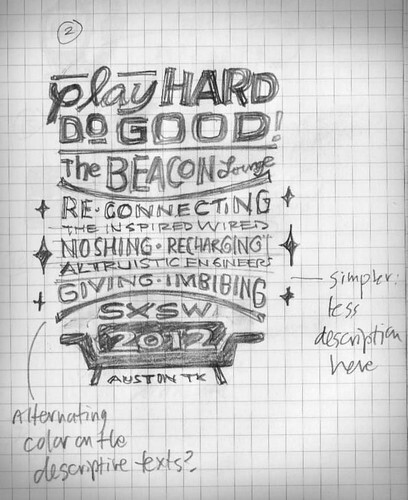 The team at GoodThreads and Beaconfire sponsored the t-shirt design and printing — I can't wait to see these shirts on Beacon Lounge guests! These custom illustrated t-shirts will be available to Beacon Lounge guests with a donation to the Sweet Relief Musicians Fund. It's great to be part of the Beacon in this way, giving back and making a difference in the lives of people. 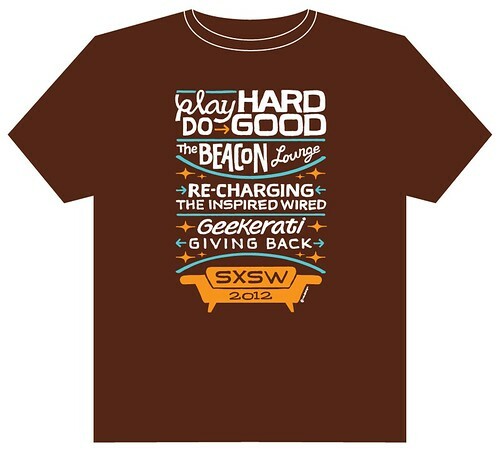 Come to the Beacon during SXSW, say hello and pick up your shirt. Thanks Rob, I appreciate the kind words! I love that you share your step-by-step process of creation—it's inspiring! I love the shirt. I've never heard of VectorMagic... Is it amazing? Much better than Adobe's offerings or what Inkscape can do? VectorMagic has a ton more control and can actually scan and create separate vector elements for full color images. Mainly I use it to capture the nuances of my inked artwork - great tool for that.